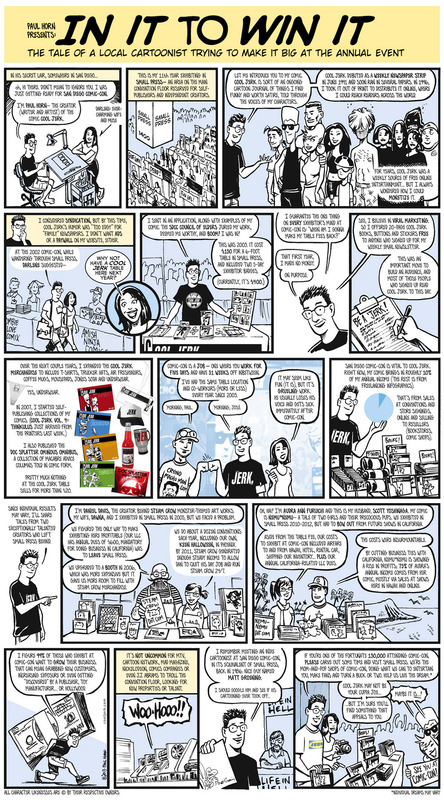 Cool Jerk » Archive » Cool Jerk and newspapers— together again! I haven’t wanted to buy a UT in a long time. Maybe I won’t use this one for its absorbency. I not only read this, but I sent my copy to a friend in L.A. who’s starting up his own comic. Very insightful and entertaining. 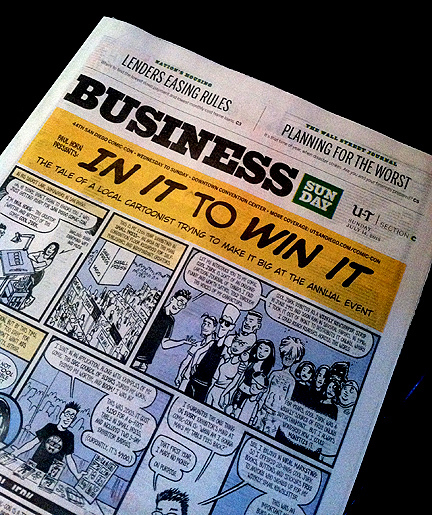 Hi Paul — it was good to meet you at SD Comic-Con and talk a bit about this comic strip you did for the UT. Do you think you’ll do more projects for them? Twenty years ago it was important for comic book artists. Now it is the equivalent of Cannes or Sundance or the Oscars. On any given day you can walk from one end of the convention center to the other and see scads of big-time celebrities, from comics and the art world to TV and Hollywood. It is as important to the pop culture industry as any film or music festival. Reputations and fortunes can be made or broken there. Thanks for uploading the large version. That’s really insightful. My sister does trade shows and I bet she has the same worries about table fees and stuff. Sign in with your Google Account (YouTube, Google, Gmail, Orkut, Picasa or Chrome) to dislike the UT TV’s video.